Hello! I'm back with another travel post of our fall road trip out west. In my first post I talked all about our two day adventure driving to New Mexico, but today's post is our actual very first day of our vacation. We started our day with some delicious breakfast burritos at the inn. They are basically warm tortillas filled with scrambled eggs, bacon, sausage, hash browns, and condiments of your choice like picante sauce, peppers, or beans. Mmmmm, yummy! My husband and I are always seeking warmer weather when we travel, yet it seems every time we go on vacation, the warm state we are visiting is experiencing record low temperatures. I swear the cold weather of the state of Wisconsin follows us wherever we go! I was FREEZING when this picture was taken. This location is just steps outside our hotel room. I had four layers of clothes on: a tank top, blouse, cardigan, jacket, plus a scarf, and I was still cold. For those of you who are interested in my fashion posts, three of the items I have on are from Stitch Fix: the feather print blouse, the clove cardigan, and the jeans. My scarf and vegan black moto jacket are from Forever 21, the combat boots are from Famous Footwear, and the black bucket bag is from Express. I wanted to wear tall brown boots with this outfit, but because they had a heel, they were impractical for a long day of walking, so I went back to my room and switched out my shoes after breakfast. Oh, the woes of fashion: I want to look fashionable, but the realities of life too often get in my way! We didn't want to see too much before Ashley and Jason arrived, so we just stayed within a two block radius of our hotel and took these amazing pictures. 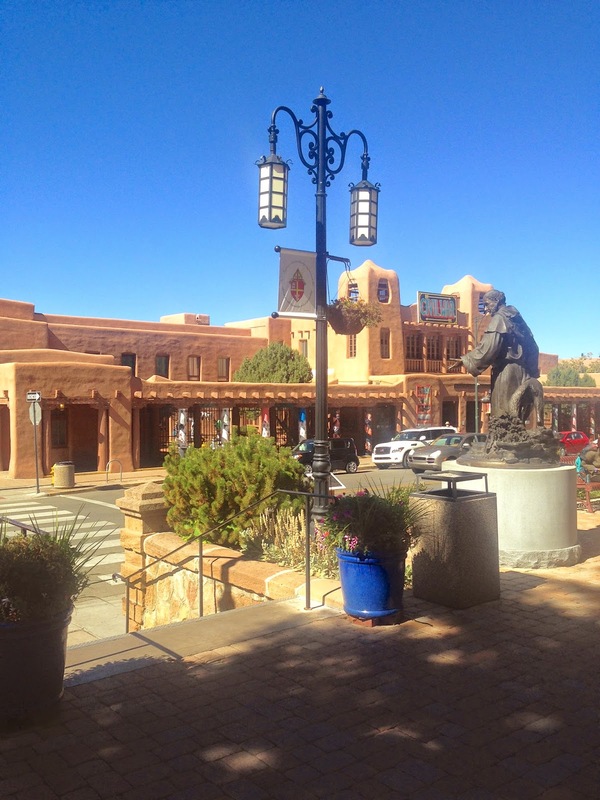 Santa Fe is one of the most beautiful cities I have ever seen. It is nestled right inside the mountains and all the buildings have this gorgeous red clay color that echo the color of the rock in the mountains. Most of the architecture in the area is the pueblo style. We then started walking down the many beautiful roads of Santa Fe. The city is labyrinth of tiny, narrow roads with adobe styled buildings. With my terrible sense of direction, I could so easily get lost in Santa Fe. But thankfully, my husband (with his handy map) led the way and always kept us on course. This town is so beautiful, you couldn't walk five feet without seeing a lovely backdrop to stop and take a picture. In fact, we couldn't get anywhere quickly, because my husband kept stopping us to take our picture. My daughter asked me 'Mom, what did you do to dad?' because he was carrying our large DSL camera around his neck and shooting pictures endlessly. I said, 'I turned him into a photographer by making him take all my Fashion Over Fifty pictures, and now he likes to do it!'. In the picture above is me with my daughter Ashley and her husband Jason. 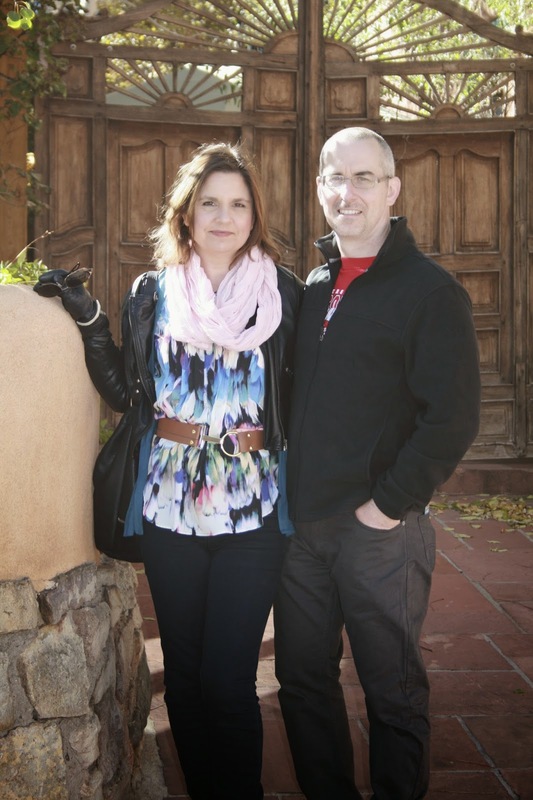 The picture below is of the lovely couple in front of a private home's courtyard entrance. Like I said, you couldn't walk five feet without seeing a lovely scenic backdrop to take a picture. And yes, your not seeing things. Ashley and I own the same exact coat and unbeknownst to either of us, we wore them on the same day! Too funny. Look at this gorgeous gate to someone's home behind my husband and I. Isn't it beautiful? I'd love to live in this house! We really loved how this picture turned out, and it will most likely be our Christmas photo this year. The entrance to this home had this intricate iron fence and gate. To my surprise also, there were a lot of flowers in Santa Fe still in bloom. I wasn't even sure they could even grow many flowers in this dry area, but many people had potted plants. I even saw a lot of spring flowers in bloom: like hollyhock and iris. What blooms in the spring in Wisconsin, must bloom in the fall in Santa Fe. One of the most interesting things the guide said to me was that the piece of land the church was built on was always used as a place of worship. He said archeologists discovered artifacts used by Native Americans for worship years before any formal building was constructed. Just outside the oldest church in America is the oldest home in America. It is not open for tourists, there is just a plaque hanging on the outside street wall to read. 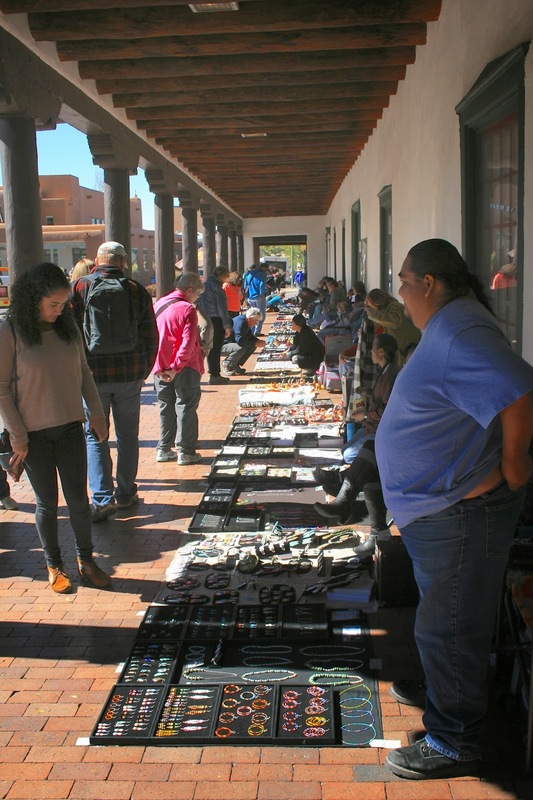 After we left the oldest home and church in America, we headed for the main shopping area of Santa Fe. This area is filled with museums, galleries, and shops of very expensive items. We were walking past this beautiful jewelry shop when we decided to stop inside and check it out. They sold hand crafted turquoise jewelry, and none of it had price tags on it. The sales people were very nice, and kept encouraging me to try on some of their jewelry. I knew anything without an advertised price was probably out of my price range, so I kept politely refusing. Finally, after much encouragement from the sales man, I relented and looked at one lovely necklace. When I asked the price, he said $1500.00! Gulp! My wedding ring didn't even cost that much. Sorry mister, but it is imitation turquoise for me! As we exited the jewelry store, we saw these hats blowing down the sidewalk. Because my husband and I both have retail experience, our natural tendency is to always 'pick up' when were shopping. We started chasing down the hats, and then we hung them back up where they were suppose to go. But one of the hats really caught my attention so I tried it on. Mmmmn, a cowboy hat? Me in a cowboy hat? I don't know. I planned on bringing my fedora that I picked up at the Wisconsin State Fair this past summer but I accidentally forgot it at home, so I really could use a new hat for this vacation. But a cowboy hat? It's just not my style. But I fell in love with the shading of the hat, and the pretty turquoise stones on the rope, so I gave in and bought it. If anything, it will keep the sun out of my eyes for the duration of my vacation, and it makes a nice souvenirer. 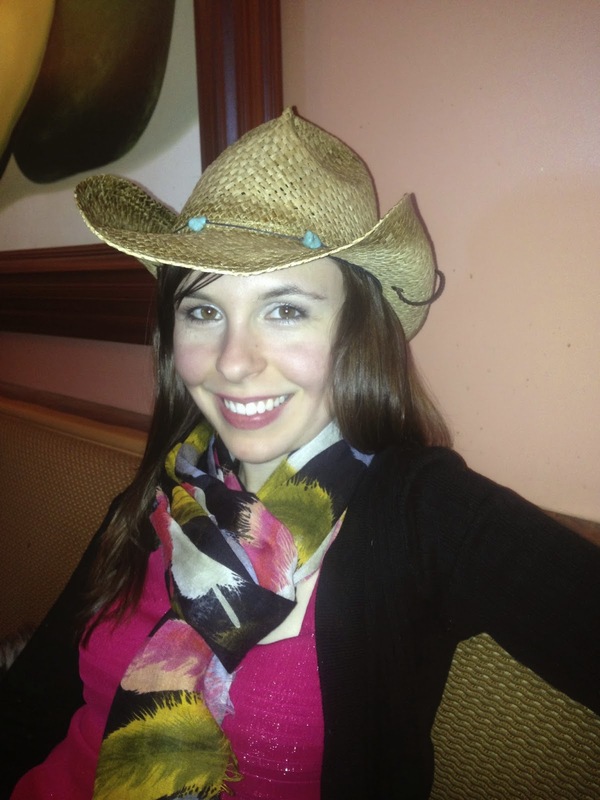 Plus, I have a story to share of how I found the hat blowing down the sidewalk…..so I guess it was meant to be. 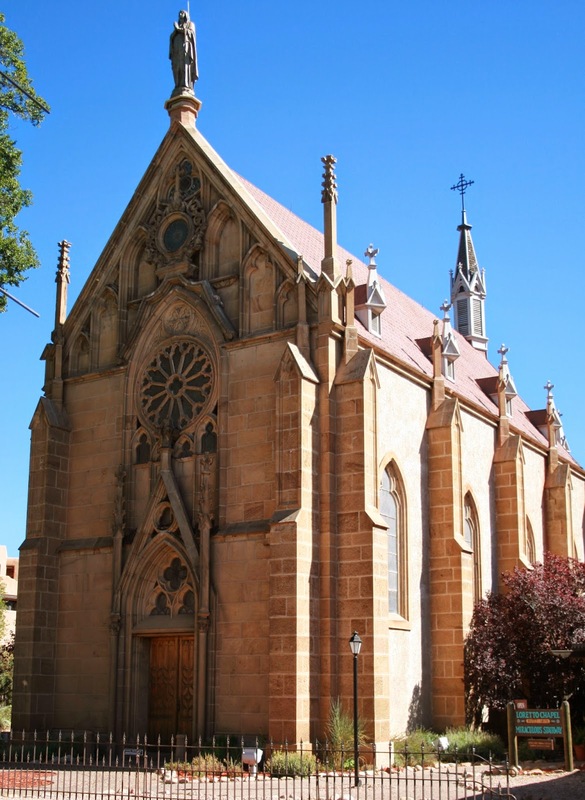 Our next stop was to visit Loretto Chapel. This church was also open to tourists and costs $3.00 to tour. 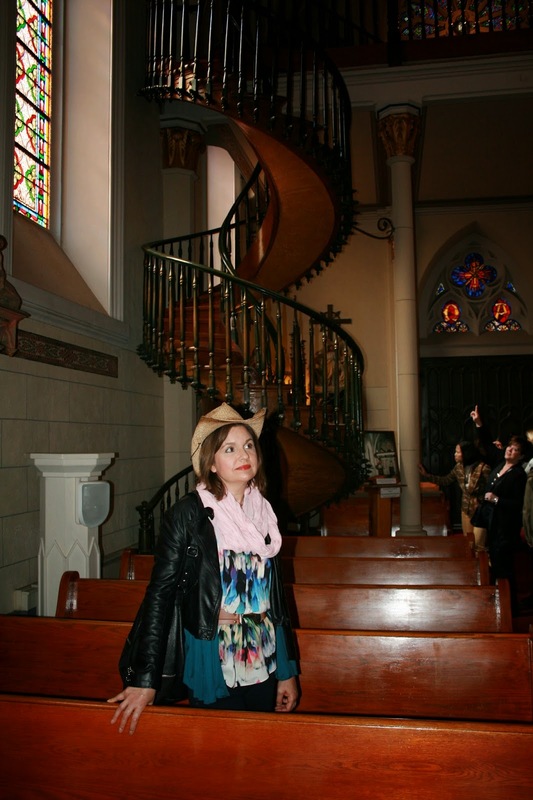 Construction of this church began in 1870, and it is most famous for it's spiral staircase. 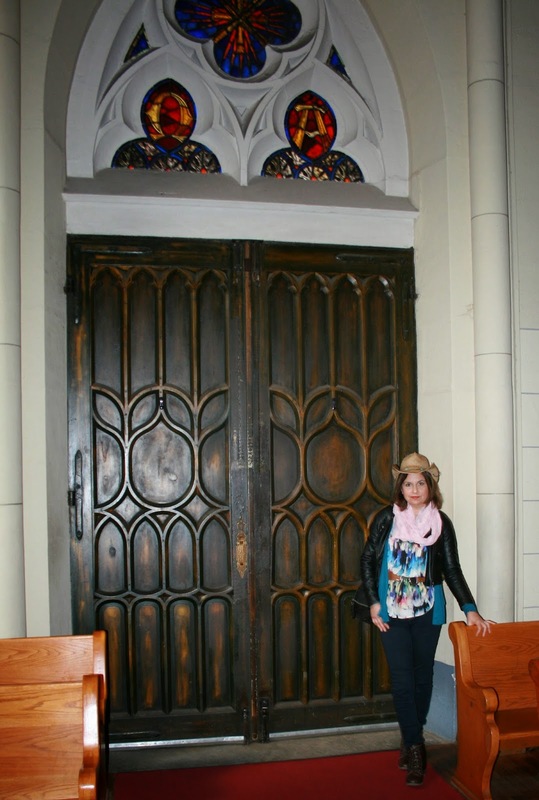 This church had beautiful large wooden doors, gorgeous stained glass, and of course, this amazing staircase which is considered an architectural miracle, for no one can understand how it has two 360 degree turns with no visible means of support. Another interesting fact about this staircase, is that originally there was not a banister. 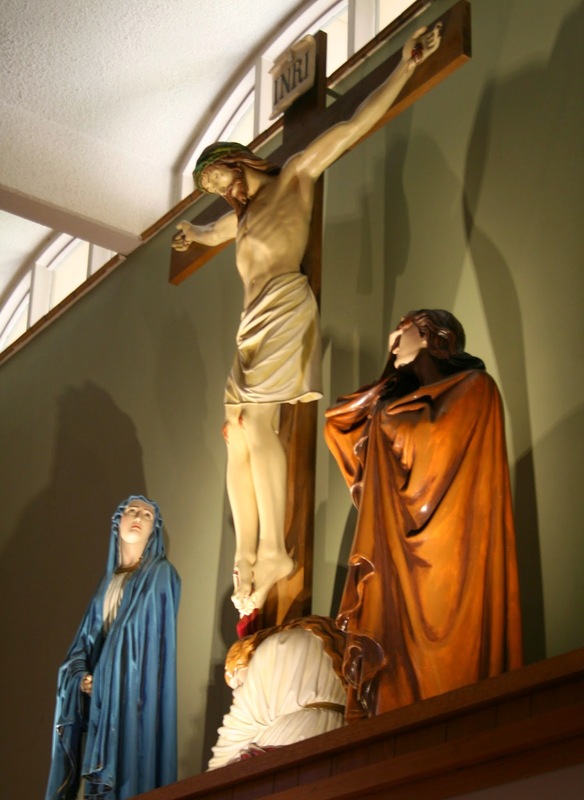 The nuns requested a bannister in later years for safety reasons. 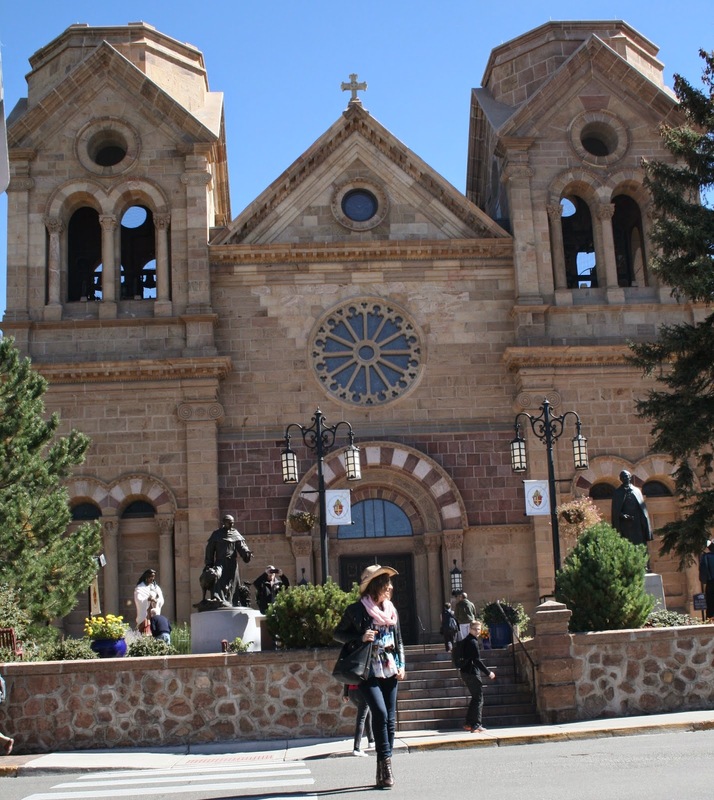 After leaving the Loretto Chapel, we started to enter the main street in Santa Fe which leads to the historic plaza. This name of this street is called San Francisco street and it has the most beautiful old world buildings and is famous for it's gorgeous view of the cathedral at the end of the street. We first stopped at this old trading post. This was an affordable place to shop, and they had many nice clothing items inside. The Cathedral Basicalla of St. Francis of Assisi graces the end of this street. It is SO GORGEOUS, especially with the mountain backdrop! The entire time I walked around Sante Fe I had to keep pinching myself to remind myself I was still in America. The roads, the architecture, the landscape, all reminded me of Europe, I simply could not believe this beauty was in America. Cathedral Park is right in front of the church, and it has lovely trees, grass, and benches to sit and enjoy the view. By now, we were getting hungry, but we didn't want to take the time to go to a restaurant and eat, so we grabbed some burritos and tamales from this vendor and ate it on a park bench. The burrito was delicious! And it only cost $3.00. The tamales were only $2.00. I never had a tamale before, so I wanted to try one. We couldn't figure out how to eat them. They are wrapped in a corn husk. Jason told me to bite into the corn husk and eat it. I tried it, but it didn't work. Did you know you can't eat a corn husk? How do you eat the thing then? I don't think we ever figured that out. So then I kinda sucked the inside of the tamale out, eventually having to open the tamale up and nibble at it that way. It was very difficult, since we didn't have silverware. My first tamale was o.k., but I'd probably never order another one. So how does one eat a tamale? Anyone know? 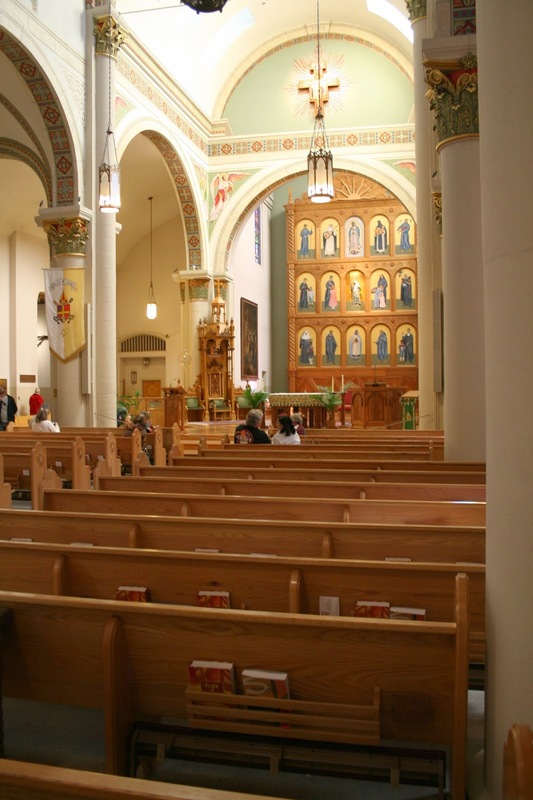 This cathedral is an operating church, so there is no admission charge to step inside and view it. 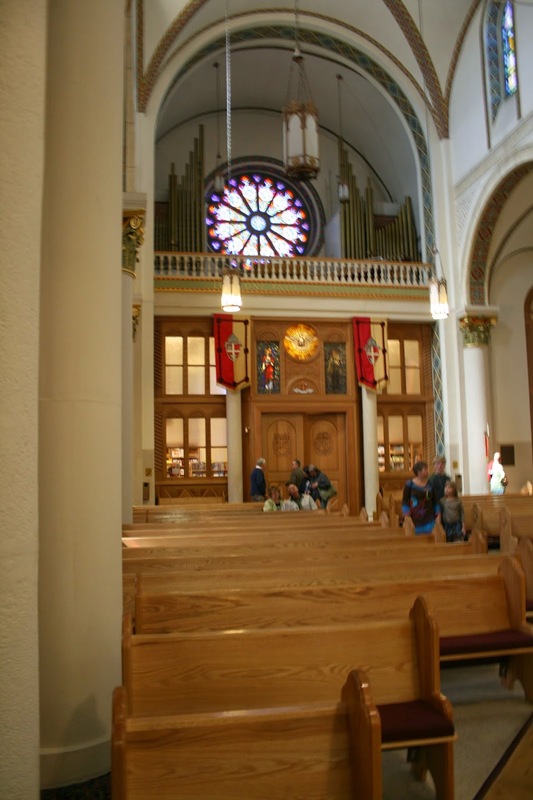 It was dedicated in 1886 and has a blending of three architectural styles: Adobe, French-Romanesque, and Modern. As always, the sculptures, and the stain glass windows were my favorites. 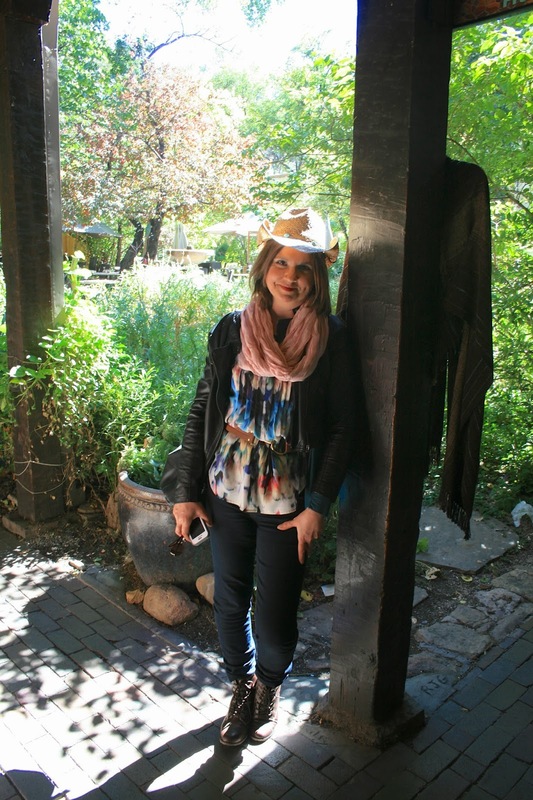 There were so many nooks and crannies in Santa Fe to explore. We would head down one road, only to discover a little alley or courtyard that would be a gateway to another intricate labyrinth of shops. We found this colorful place that actually was a historical marker for a nuclear laboratory during the cold war. So interesting. In this same area as this labyrinth of shops was this gorgeous court yard filled with lush green plants and trees. Certainly not the desert landscape I imagined when envisioning New Mexico! This is the view when standing on the top of the stairs of the Cathedral. I really fell in love with the architecture of Santa Fe. The color especially was so beautiful to me, it seemed to glow and change with the movement of the sun. Another beautiful old building across the street from the Palace of the Governors. The Palace of the Governors was constructed in the early 17th century as Spain's seat of government. Today it is the state's history museum. Outside of this building, Native Americans sell their hand crafted items to tourists. By now, I had been walking for a good part of the day and I was ready for some chocolate. We had actually seen several chocolate shops in downtown Santa Fe but I was looking for a specific place that I had read about on the Internet called the Kakawa Chocolate House. It was quite a long walk from the historic plaza area, but we eventually found it. It is a quaint little place, but it is very expensive and it was crowded when we were there so we didn't really get to enjoy the atmosphere. They offered free samples of their drinking chocolate. It is very rich. One sip is really all you need, which is probably why it is served in little, itty, bitty cups. The boys decided the place was too rich for their blood, and they went and sat outside while us girls tried to figure out what we wanted. We decided to split a scoop of handmade ice cream, and then we purchased some dark almond bark and dark sea salt chocolate. The total for 2 pieces of candy and one scoop of ice cream came to $13.00. The chocolate was very fresh tasting and delicious, but the ice cream was just o.k. I've had much better hand made ice cream before. After leaving the chocolate house we discovered this beautiful fall tree. The one thing that surprised us most about Santa Fe and Albuquerque were the trees. We were expecting to see nothing but rock, desert, and cactus, but to our amazement, they have a lot of beautiful trees: deciduous and coniferous. Hanging chili peppers are everywhere in Santa Fe and Albuquerque. I kept meaning to buy one for my own home, but unfortunately, the timing was never right, and I left empty-handed. I could really see these hanging in my kitchen! They are so pretty! I always love interesting doorways, and this one is no exception. Could it be more charming? 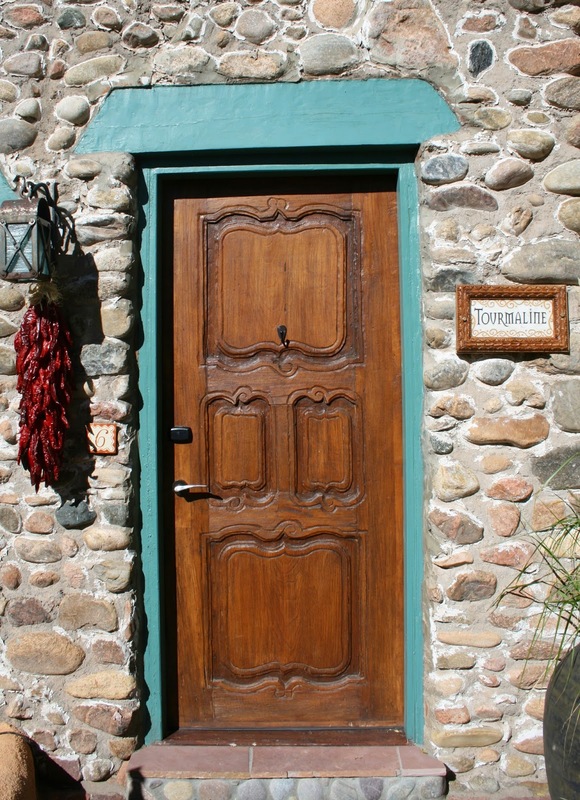 Don't you just love the contrast of the pebble stone wall with the beautiful wood carve door, and the teal painted wood trim? Gorgeous! Our final destination of Santa Fe before dinner was another church. This one was actually located inside a cemetery. 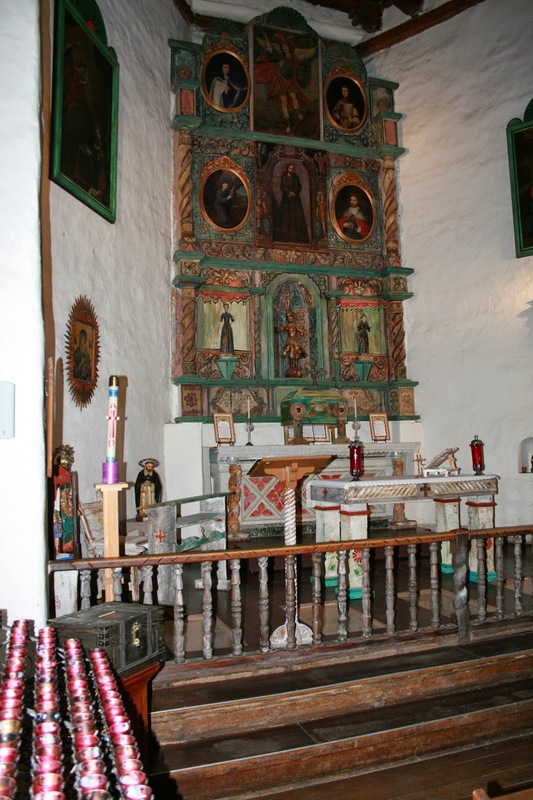 It is called Rosario Chapel. It was closed at the time, but there were some workers there preparing for a funeral, so they kindly let us inside to take a peek. 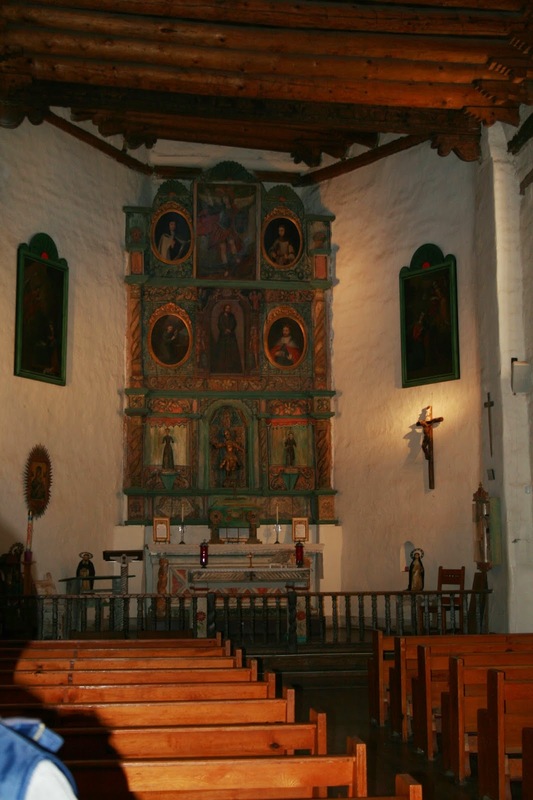 It had the same style of wooden beam ceiling that the San Miguel Chapel had. I just loved the rustic blend of wood mixed in with the adobe architecture. Outside the chapel was parked this hearse. My husband thought this was the coolest hearse he ever saw and said that he would drive this. I promised him that if he went before me, I would see that he got to ride in one that looked just like this. I love the smiles on their faces, and how comfortable and close they look. This is family. The only thing missing is my son. But he is away at school right now and couldn't make the trip. 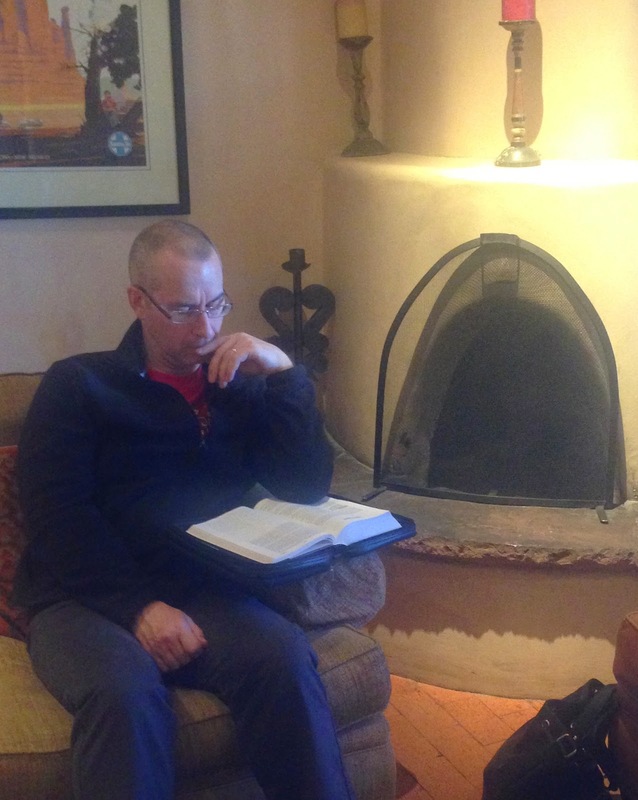 And thus ended our day in Santa Fe. I loved this city. It is such a romantic, beautiful city. You should see it lit up at night: it's almost magical. I haven't learned the art of night photography yet, so you will have to look up pictures on the Internet to see how gorgeous this city is at night. 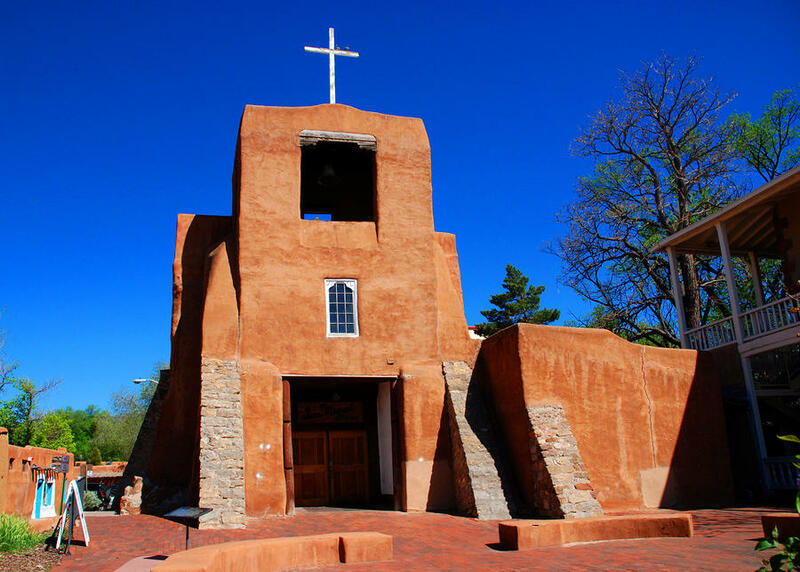 There is so much to do and see in this area we could have spent a week in Santa Fe alone. There are countless museums (which we didn't see any because of lack of time), state and national parks, caves, hot springs, unusual geographical formations, etc., but we were on a road trip, so we had to keep going. I hope to one day return, and see everything I missed. Next week's travel post: Our journey to Albuquerque via The Turquoise Trail! Looks like a really beautiful city, and so different from the cities I am used to here in the midwest! Great photo's Amy and love your outfit!